I've read so many blog posts reviewing the H K Girl - Glisten & Glow top coat, I just had to have it myself. Was it really all they were saying? Could I really replace my Seche Vite? There was only one way to find out. I went in search of it, and the only place here in the UK I could find it was Rainbow Connection. For weeks, each time I checked, the standard size bottle was always out of stock. It appeared it was being bought up in bulk by converts and lovers alike and I thought I'd never get a chance to try it. I decided to take a gamble and bought the large 2.5oz bottle, (£23.50) which comes with bling and curled ribbon. Cute touch. A 2oz refill bottle is available (£22.50) but in my opinion, the half ounce and fresh bottle would be worth the difference in price. • Fast drying – approx 1-2 minutes often less and your nails will be dry, as time passes it will dry more within 5 minutes or so it's rock hard! So I'm going to try my best at seeing what's true and what's not. This was my first try with the top coat. 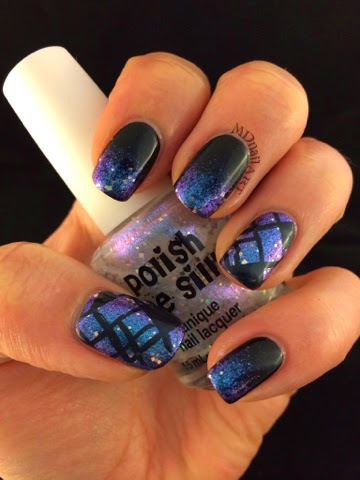 Just a simple mani with a couple of foil effect stamps. It was a dream to apply. There was no need to rush application, as you sometimes have to with Seche Vite, there was no streaking or premature drying. The formula was a nice consistency too. Day 1 it was super shiny, and practically rock hard in 10 minutes. The initial touch dry was a little longer than Seche Vite, but ultimately, H K Girl dried harder, faster. There was no dings, or scrapes which sometimes occur with Seche Vite, (when you think it's dry and it's not). And on day 4, it was just as shiny, no surface scrapes or chips at all, but there was a little tip wear on the free edge, (I think we could expect this after 4 days), and there was shrinkage! I don't think there was as much as I would have got with Seche Vite, but it's there all right. I probably could have gotten away with wearing this mani a little longer, but 4 days was a push for me, getting stuck with the same nails. So these nails were done 2 days before this photo, and have survived housework, lifting 14kg bags of dog food, ten pin bowling and playing underneathe the hood of the car, without a single scrape, dent or chip. Pretty impressive really. And because the formula isn't too thick, I could layer the H K Girl over different designs as I added to it and my nail thickness barely increased at all. 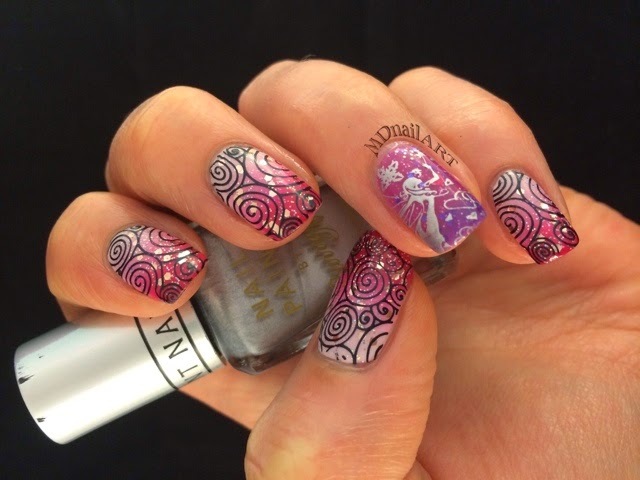 The above mani began as a 3 colour gradient using Barry M Gelly's, Rose Hip, Dragon Fruit and Pomegranate. The ring finger is Polish Me Silly - Grape Intentions. It was then topped with Glisten & Glow. 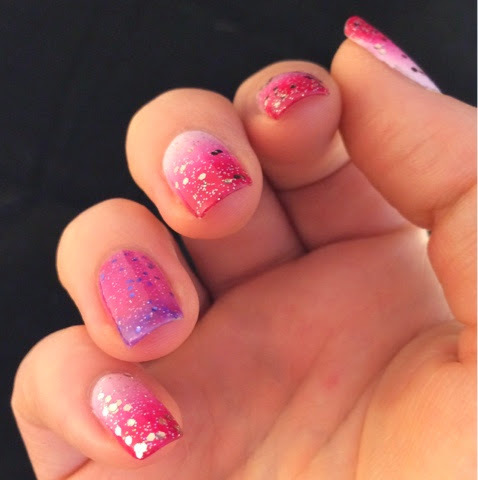 The next day Barry M Rose Quartz glitter topper was added to the gradient. and topped with Glisten & Glow. 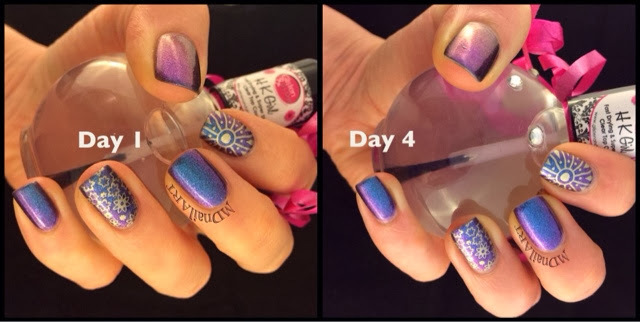 After survivng a lot of punishment, I stamped over with Konad Black Pearl & Barry M Silver Foil Effect and again topped with the H K Girl top coat. Including my base coat that's quite a few layers, but there's no thick build up I would often get with one layer of polish of a base coat and Seche Vite. I accidentally found that the top coat can hide some mistakes. I was in a hurry and began stamping before the base polish was completely dry. The inevitable happened, and it wrinkled the polish underneath like it was cellophane. With the intention of redoing those nails later, I went ahead and applied Glisten & Glow to those nails, and miraculously as it dried, it smoothed out the wrinkles. The finished result still showed flaws in the stamping, but not enough to make me want to start again. On another occasion, I managed to dent my thumb before it was completely dry, but it too "fixed itself" as it hardened. 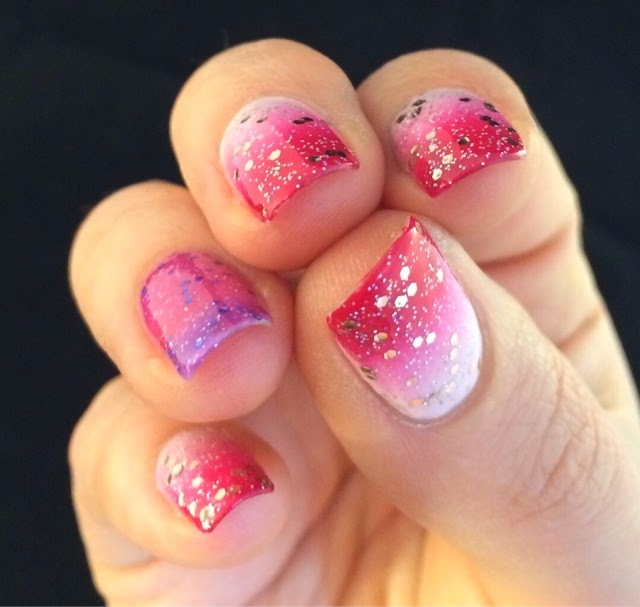 Is this a miracle top coat? I've been trying out this top coat for over a week now, and I must admit, at first, I was dying to hate it. I've been such a Seche Vite fan for months now, and I didn't think anything could beat it. But all my mani's have resisted everything that's been thrown at them and has avoided that awful scuffs on the surface I would sometimes get after a day or two with Seche Vite. With Glisten & Glow, it remains as good as the day it was painted. I might not buy any other top coat again.